It will not have escaped your attention that the country is experiencing some financial turmoil at present. The news in the last 24 hours has been dominated by a claim that 10,000 police officers will be lost over the coming year. I have no idea if these numbers are true (I’m not sure anybody knows yet), but it is safe to say that in years to come there will be less police officers, less fire officers, less local authority employees , in fact less of lots of people employed to look after us. I claim no insider knowledge here, I have a good idea what is going on within policing, but a combination of common sense, and watching the news leads me to anticipate a reduction in these posts. Essentially for any organisation, people are the most expensive resource, and therefore any significant reduction in funds is likley to see less people on the ground. We are all trying to make sure that we preserve as many frontline staff as possible, but we will need to explore new ways of delivering our service in these hard times. One of the difficulties facing policing is that we are often seen as the service of last resort. You will have heard the 999 tapes where people ring us up because they have lost their house keys or can’t find their cat. All services are going to have to take a long, hard look at what they have the capacity to deal with. I can remember as a young Sergeant volunteering to go to a job where a group of kids had reported seeing a snake. Overcome by a feeling of gallantry, I decided to go and save the kids from what I was sure would be a small grass snake. On my arrival, the snake was about 7 feet long, bright yellow, and not at all intimidated by me and my extendable metal baton. I ended up having to phone Dudley Zoo, and a man (who I later found out was Mark O’Shea, a famous reptile wrestler from TV) turned up, muttering something about it not being dangerous. He duly dispatched the snake into a bag and the world was safe again. This illustrates my point, whose job is it to deal with escaped snakes? Who says that police have to deal with lost property or take in stray dogs? I’m not saying we shouldn’t, but we are going to have to find ways of helping people to help themselves in some areas where they would previously have rung us. This is where we come on to hyperlocal sites. My view is simple, all public services ought to be reading, and engaging with hyperlocal sites in areas that they serve. They are an incredibly important method of talking to our communities and finding out what their priorites are, what they are worried about, what they want us to do, and what they are happy for us not to do on their behalf. They already exist, and they are just waiting for us to engage with them. I would go a step further and say that public bodies ought to be actively encouraging communities to set up hyperlocal sites. There are some fantastic examples of communities making a real difference to their local environment through this medium. Will Perrin from talk about local is well known for his work in this area. He talks about a community who were fed up of dog mess being left on the pavements outside their houses. They came up with the ingenious idea of making little flags branded with the name of their local authority. They then planted these flags in every dog ‘deposit’ they could find, took a picture, and posted it online! Needless to say, it did not take long for the local authority to get it’s act together and clean the streets on a much more regular basis. When a child loses her cat, they would have a much better chance of finding it if a picture of Tiddles was posted on a hyperlocal site covering their postcode than they would have from asking a police officer to find it. The same is true of a whole host of other issues that communities can actually resolve for themselves, without going to their local public bodies. The local bodies responsible for that area have a new way of engaging with, and having conversations their communities. Once these sites are in existence, we can then talk to them, help them, and of course take flak from them when we aren’t getting it right. 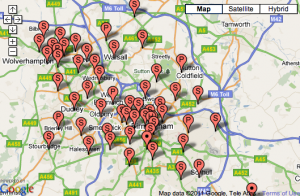 If you click here it will take you through to a simple tool which enables you to search for a hyperlocal site in your area. Any neighbourhood police team, housing association, parent/teachers association or any one of the other public bodies working in an area with a hyperlocal site should be talking to them. If there isn’t one on your area, try and work with the community to set one up, there are loads of people out there happy to help and advise. I do not pretent that these sites are the solution to all of our problems, or that there will not be really difficult decisions to make moving forwards. Nontheless when we make decisions about local services, we ought to do so from a position where we have listened to local people and allowed them to influence us. As a Superintendent in Wolverhampton, I will be regularly reading the excellent WV11 and hopefully making the odd contribution. I would urge all of my police colleagues to find their local sites, read them, and engage with them.